Betty Ford – Lisa McCubbin discusses the relevance of Betty Ford in light of the current #TimesUp women’s movement with a multimedia presentation that touches on the former First Lady’s trailblazing achievements in alcoholism and addiction treatment, women’s health, and equal rights. 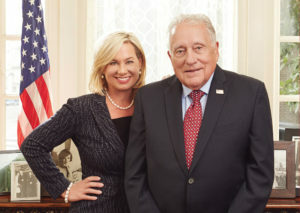 The dynamic chemistry between Lisa McCubbin and Clint Hill is evident in their unique conversational presentation in which McCubbin interviews Hill, posing questions that bring out Hill’s unmatched insider perspective on politics and protection, against the backdrop of rarely seen photos and videos. Mrs. Kennedy and Me – Hill reminisces about his four years as Jacqueline Kennedy’s Secret Service agent from 1960 – 1964. How did a Secret Service agent who started life in a North Dakota orphanage became the most trusted man in the life of the most captivating First Lady of our time? History comes to life in an unforgettable hour filled with humor and drama, against the backdrop of rarely seen photos and videos. Five Days in November – Hill’s moment-by-moment account of the trip to Texas, the assassination of President Kennedy, through the state funeral in which Hill witnessed that unforgettable salute by three-year-old John F. Kennedy Jr.
Five Presidents – Hill’s observations serving Presidents Eisenhower, Kennedy, Johnson, Nixon, and Ford—three Republicans and two Democrats. Behind-the-scenes anecdotes during the tumultuous era that included the Cold War; the U-2 spy incident; the assassinations of JFK, Robert F. Kennedy, and Martin Luther King; the Vietnam War; Watergate; and the resignations of President Richard M. Nixon and Vice President Spiro T. Agnew. Clint Hill will forever be remembered as the courageous Secret Service agent who leapt onto the back of the presidential limousine in the midst of the assassination of President John F. Kennedy in Dallas, on November 22, 1963. He rose through the ranks of the Secret Service, serving five presidents—Eisenhower, Kennedy, Johnson, Nixon, and Ford—eventually retiring as Assistant Director, responsible for all Protective Forces. After his retirement in 1975, Hill spiraled into a deep depression, suffering from undiagnosed Post Traumatic Stress Disorder (PTSD) that stemmed from witnessing—and being unable to prevent—the assassination of JFK. At the age of 77, he met journalist Lisa McCubbin and she convinced him that his memories were important to history. With insightful, and often humorous anecdotes, as well as his riveting moment-by-moment account of what really happened that day in Dallas, Hill’s incredible story is one of courage, integrity, and resilience.